The “Soggy Doggy” Reminded Me…. This Christmas I was definitely NOT going to spend the multiple days and trips up and down my attic ladder needed to lug the 12 + large crates of decorations out when we were going away for the holiday. My life was too frantic, my back giving me fits, and I needed a break. I could not, would not. Definitely. End of story. Maybe a small tree, but that’s ALL! And then, at Thanksgiving, there was this look from my 20 year old baby girl when I proposed the idea. And a gentle yet sincere “But Mom….” And then I recalled last year, my grandson’s first here in town, and how, even at two years old, he was captivated at helping to decorate my little backroom tree with all the kid ornaments from over the years. And I remembered the Santa Scavenger hunt. And….I caved. But in order for me not to be resentful and feel burdened, I somehow had to reframe my mind. I had to enjoy the process, darn it, because I would not be around to enjoy the product for long, as we’d be off for the holidays. What hit me, like a ton of bricks, as the boxes began to be opened, was that the process of decorating for this special holiday really had little to do with the end product. Being able to relive the scores of moments from the years of Christmases past through each Santa Claus unpacked, each ornament commemorating special occasions – the “year of the first Nutcracker experience,” or “the year of learning to drive,” or “the year son 1 turned 21” – these flooded my mind with thoughts and my heart with love and gratitude for those treasured ones I call my family. Pulling out the book, “Count the days till Christmas,” that our Benjamin could recite by heart at age two and couldn’t wait to unpack each year, Ben and Grace’s handprint ceramic plates, the photo ornaments of the three kids in the most creative (and silly) poses I could come up with, the treasured Santa that came from my childhood home…..each “thing” became a moment in time relived, and flooding my heart were memories in time when we stopped, as a family, to relish in the season. When my daughter arrived home from college this year, walking in from the airport at three in the morning, and I caught a glimpse of her stopping, dead in her tracks, to look around in the living room, smiling at the sight of the tree, taking in each of the accouterments, it hit me: How could I have even considered NOT “decking the halls?” Who CARED what the end result looked like, or that I wouldn’t be there to enjoy the finished result? It was all about the process, and rekindling memories of the heart, and somehow, as I basked in the process, my heart was filled to the brim, once again. In my business, we talk a LOT about being “in the moment,” and what it takes to be fully present as a teacher in class. Any thought of the future (what comes next) OR of the past (regrets of things undone, stresses you carried with you into the moment you are in) ROB you of being in the moment. You cannot be fully present to the moment you are in, nor embrace “what is” right now, unless you channel yourself out of the past and the future. In doing so, you must also let go of the results you desire for the moment you are in and let them unfold organically. Here’s an example: my daughter-in-law had, on her Christmas wish list for my grandkids, age-appropriate games they could begin to play together. 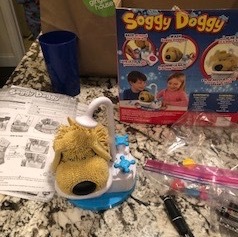 I searched and found “Soggy Doggy,” a game that has a cute, rubber dog siting with a shower rod over his head and a water-filled tub basin below him; with each roll of the dice a playing piece is moved around the board, and a resulting instruction on each landing spot has the player turning or pushing the shower knobs; with each push/turn, the doggy has the possibility of having “had enough” of the bath, whereby he begins to shake incessantly. Now I LOVE board games, and was a bit determined to understand, and properly teach our 3 and 2 year old the rules – only TWO twists of the faucet, per the instructions on the space on which you land, going only one direction around the game board, etc! But once the doggy had his first shaking frenzy, all rules were abandoned, as the kids just had to sneak in an extra turn and push of the knobs to achieve “shaking status,” after which they would laugh hysterically. At first I tried to regain order (and “control” of the situation), but it hit me, suddenly, that my desire to see how winning was achieved (by making my daughter-in-law get out the instructions and read these details) robbed me, a bit, of the sheer joy of the moment we were in – Momma, Aunt, Grandma, and two precious ones siting, on the kitchen floor, in anticipation of a silly shaking, wet dog, in anticipation of laughter that filled the room, in anticipation of creating a Christmas memory, one that could be relived like the Santas and ornaments unpacked each year. Stop to think about living towards “product” (ie achievement) or embracing the “process.” How can you frame your heart and mind differently in 2018? How can you give yourself fully to whatever moment you are in? What does it require of you? For me, it requires, for one, not being ruled by the clock! It means accepting that the moments of each day will come and go, ebb and flow, like the tide of the ocean, regardless of what I do (or do not do), and that this is exactly as it should be; it means putting down my phone more and tending to the faces and words of those around me; it means being organized and prepared so I can let go in the moment I am in; it requires knowing that I am human and fail, but also that, as one who tries to embrace excellence, integrity, love and acceptance, when I do my best, my best is good enough for the moment I am in; it means not looking back or judging the past (nor that of another! ); it means not being ruled by the opinions of others; it means knowing that I am forgiven by the one who loves me and who matters most; it means knowing that each tomorrow is another beautiful day of opportunity. As I work towards these things, I can give my heart and mind fully to the moment I am in. The results are acceptance, patience, forgiveness, love and peace. And if I can foster that for my own being, my heart and mind are transformed, and I can extend the same to others. I wish for you, friends, such a “process over product” life in 2018, and its resulting richness and abundance in the coming year. 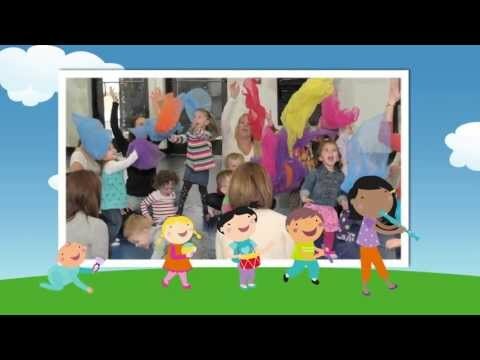 Previous post: Kids – No Hidden Agenda There!